We are located less than a 5-minute walk from Haymarket MBTA Station located at the corner of Congress and New Sudbury street servicing the Orange and Green lines. Also, just about a 5-10 minute walk from Government Center and Park Street MBTA Station by Boston City Hall servicing the Green, Red and Blue lines. 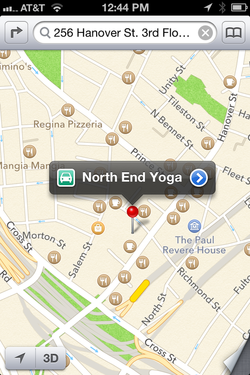 North End Yoga VALIDATES parking Parcel 7 Garage at 94 Haymarket Square, just two blocks away from the studio on Hanover Street. Validated tickets are $1 for 2 hours and $3 for 3 hours of parking. After the 3 hours you will be charged the regular rate. Validation can be stamped at the front desk before class. Driving entrance is on Sudbury St. walking exit and entrance can be on either Hanover or Sudbury St. See map.